Brandy Klark (Aubrey Plaza) prides herself on her academic achievements. She has the highest GPA ever at her school. She is valedictorian. But she hasn’t experienced all the things most high schoolers have. Her sister, Amber (Rachel Bilson), on the other hand, is very experienced. Their over-protective dad (Clark Gregg) is fine with Brandy’s innocence. Their mom (Connie Britton) is a little more lax and supportive of their daughter’s sexual education. Brandy’s friends (Alia Shawkat and Sarah Steele) trick Brandy into going to a college party. There she meets Rusty Waters (Scott Porter). And gets drunk for the first time. It doesn’t end well. After an awkward first kiss from Rusty, she becomes smitten with him. She’s mortified when she realizes he is her supervisor when she takes a lifeguard job at the rundown local pool, managed by burnout Willy (Bill Hader). After some heavy hazing from her new coworkers, pressure from her friends and her sister, Brandy decides she has to get more experienced before she heads to college this fall. Amber gives her some much-needed advice, prompting Brandy to create a “to do list” of sexual experiences, leading to losing her virginity to Rusty. Cameron (Johnny Simmons), her lab partner, and the guy who has been in love with her for some time, is the lucky recipient of most of the items on her list. Once word gets out, though, everyone is trying to get in on the action. As one would expect, this leads to tension between Brandy, Cameron and her friends. The To Do List is set in 1993, coincidentally, the same year I graduated from high school. This makes for a lot of things I can relate to from my own high school career. At first, I wondered why it was set 20 years in the past. I feared that it would be an attempt to be a nostalgia film, with most of the jokes based on making a caricature of the time. This fails more times than not. I was pleasantly surprised that it never got gratuitous in regards to the 90s references, save for one mention of “electronic mail” at the end of the movie. In fact, the time frame is necessary to the story, shockingly enough. Not having the film set in today’s world removes things like Google and Urban Dictionary from the picture, leading to a decent number of jokes that wouldn’t work had Brandy been able to just look up some of the sketchier items on the list. Growing up with a fairly sheltered life, I could relate to Brandy, although I never made a list before I went to college. As an adult, I can definitely relate to Clark Gregg’s character as the overprotective dad who doesn’t really want to know or admit what his daughters may or may not be up to. The film works on multiple levels. The cast is packed with comedy heavy-hitters. I’m not just referring to the likes of Bill Hader, Andy Samberg and Christopher Mintz-Plasse. It is a veritable who’s who of younger sitcom stars. They work and play well together. There is good chemistry between everyone. A film like this shows that given a good script, women can lead a comedy as well as any guy. Aubrey, Alia and Sarah make the film a comedic success. 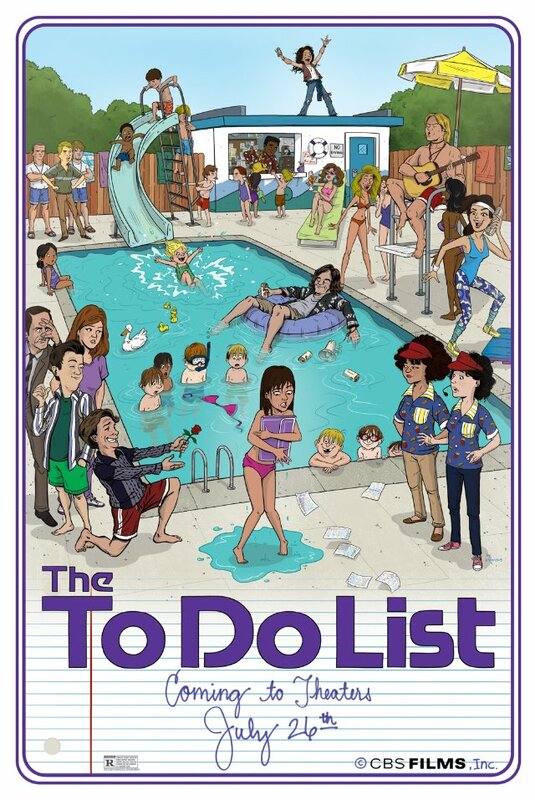 The To Do List is a typical graduating high school, looking to lose their virginity, coming of age film. Only, this time, it’s told from the girl’s point of view. There are plenty of gross-out and risqué jokes, but what did you expect? Think American Pie from the opposite side of the fence. There are some scenes that really push the envelope, and the ladies carry them off spectacularly. This movie isn’t for everyone, 9-10-year-olds (yes, there were some at the screening) and my mom included. If you like American Pie and its ilk, then you’ll enjoy this. I laughed most of the way through the movie. If Pacific Rim is the action movie of the summer, The To Do List could be the summer’s big comedy.